The following is an operational review focused on Operation Euphrates Shield, launched, coordinated by the Turkish Armed Forces and spearheaded by the Free Syrian Army (FSA) and allies. realization of the Rojava Federation, which was officially self-declared earlier this war. 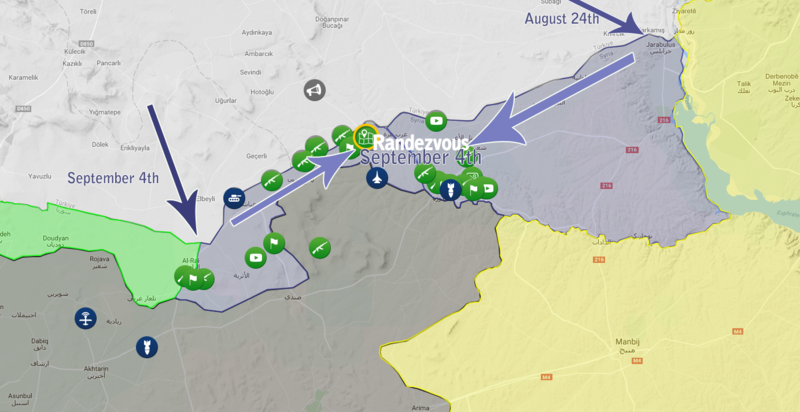 On 4th of September, 2016, Turkey has entered Syria through Al-Rai, the other Syrian city located at the extremity of the remaining Turkish-ISIS bordering land. While on the eastern “mini-front” started in Jarabulus were significant advancements, Ankara sent tanks, artillery and operators to assist the FSA groups located in Al-Rai in liberating the city and then marching along the border to rendezvous with the troops coming in from Jarabulus. The secured territory was united around the evening of 4th of September. While military assets for a northern Syrian incursion were available even in 2015, the main problem revolved along the political consideration of such an operation. In late summer 2015 Russia just announced its intervention in the war, thus complicating Turkey’s position which didn’t had damaged relations with Moscow at that time. Later on, Turkey searched for a perfect opportunity, while swimming through troubled waters in both political and military sectors – Failed Coup generals rumored to have sabotaged a 2015 intervention in Syria. However, the recent moderation of relations with Damascus and Teheran and re-opening talks with Russia has offered a strange and unexpected “window” to operate. The US needed to also support Ankara’s operation in order to repair its degrading post-Failed Coup relations (that also implicated the faith of the US soldiers inhabited Incirlik base; un-officially hosting nukes), even if that means tolerating Turkish attacks against direct vetted and supported operational allies as the YPG and wider SDF. We strongly believe that the Turkish operation would not stop just at the level of security enforcement alongside the border but will actually extend towards completely ousting Da’esh southern the Governorate in order to block any possible connection between the Hasakah Kurds (SDF, YPG) and the Kurdish fighter in Afrin. In other words, the “security zone” will expand.